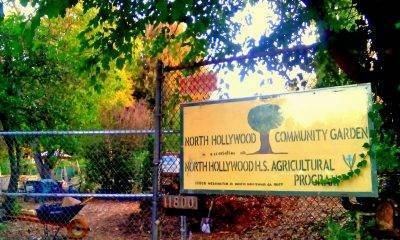 The North Hollywood Community Garden is affiliated with the North Hollywood High School Agricultural Department. The North Hollywood High School Community Garden (now known as the North Hollywood Community Garden) was originally created in 1999 by Randy Vail, teacher and coordinator of The Naturalist Academy, a small learning community, at North Hollywood High School. Jennifer Reed was the Garden’s first President. The one-acre Garden is on school-owned property and part of the eight acres of agricultural property of NHHS. The Agriculture program is one of only three left in the San Fernando Valley and in the Los Angeles Unified School District. From the inception of the Community Garden, Mr. Vail was our sponsor and advocate. However, in the summer of 2007, Randy and his family decided to move on to a less hectic way of life and leave the city and NHHS. We continue to remain thankful to him for his foresight and sponsorship. Fortunately, the Community Garden passed from the founding hands of Randy Vail into the very capable hands of another wonderful NHHS teacher. Beginning August 1, 2007, the Community Garden was sponsored and supervised by Mrs. Rose Ormsby-Krueger, the succeeding teacher and coordinator of the North Hollywood High School Agricultural and FFA (Future Farmers of America) programs. Thanks to Mrs. Krueger, the NHHS agricultural program continued to thrive and grow. In 2009 she was able to bring in Andrew Lepore (a former student) as a volunteer farm manager, and in 2011 Andrew was promoted to communication aide and farm manager for the program. In June of 2016 Mrs. Krueger retired from LAUSD, and Andrew Lepore took over the continuation of the program and its FFA chapter. As of January 2018, he was promoted to Full Time Faculty. He continues to bring great enthusiasm, support and success to the program, its FFA chapter, and the Garden. Additionally, during the course of several years, Mrs. Krueger, in collaboration with one of our former Community Garden “Adjunct” gardeners, and through the sponsorship of our Community Garden, applied for and was awarded multiple City of Los Angeles Beautification Grants. One grant was responsible for the creation of the extensive and beautiful flower garden adjacent to the Community Garden. A subsequent grant provided for the replacement of the unused concrete bins on the northeast side of the school’s agricultural grounds with a rose garden dedicated to survivors of breast cancer. Flowers from both gardens were used by the students in Mrs. Krueger’s Flora Culture classes. By growing their own flowers the students were able to sell their arrangements and were no longer required to pay a materials fee for flower purchases; Andrew Lepore and the program’s current students are continuing this practice, which is both a credit to the outstanding success of the program as well as the continued ongoing collaboration with our Community Garden.